The 26th part in the GINZA×CSR series introduces Ginza Cave Fujiki, a specialty natural wine shop run by the Fujiki Liquor Store that opened in 1889. The company that stays ahead of the times, for example spreading foreign liquor culture in Japan after WWII and providing new value now sells mainly natural and domestic wines. 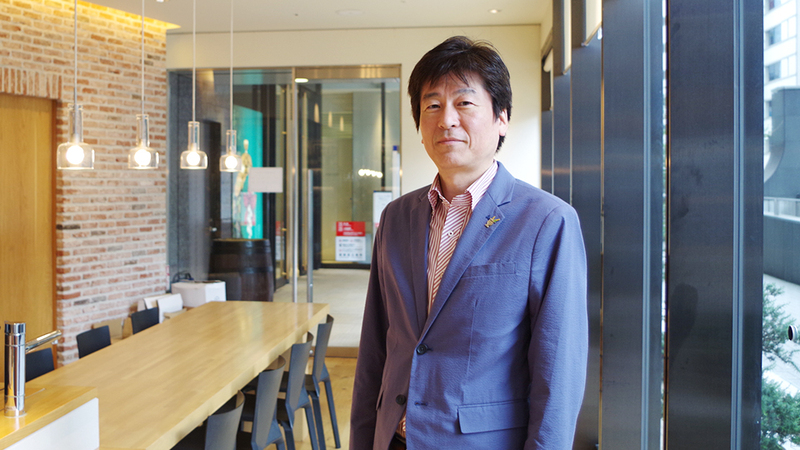 Today we spoke with Toru Fujiki, president of the company. ─Ginza Cave Fujiki was opened here in 2010 as a specialty natural wine shop. Please tell me the story of when your store opened. We were originally from Ibaraki and ran a soy sauce shop. We then moved to Ginza and changed to a sake shop. There used to be canals around here to transport sake barrels. Then we entered the boom in economic growth and Western-style culture like cabaret clubs spread through Ginza. Then, establishments began selling whiskeys, wines, and other foreign and imported liquors that were considered special types at the time. ─What stimulated you to shift to natural wine? Now the regulations have changed and you can get all types of alcoholic beverages in various different places. Since I wanted to sell a product that was distinctive of Ginza and I had studied wines so hard, I decided to create a specialty wine shop. Actually, I had no intention at first of focusing on natural products. At the time, natural wines tended to be taste muddy and earthy and I often did not like them. Wines play an important role in delivering richness to tabletops. So, I feel that our wines being delicious in addition to organically-grown and pesticide-free is the most important thing. The ratio of natural wines we sold when we first opened was about half of all our products. Then, natural wines hit the spotlight in the mainstream market and we slowly increased the number of our natural wines. ─In recent years, there has been an increase in interest in natural and organic food because of consideration of health and the environment. What do you feel are the strengths of natural wine? Natural wine often goes down very smoothly when you drink it. I feel that this reflects the individual characteristics and mindset of the wine maker. People may think that wine is made by squeezing the juice out of picked grapes and then putting them in casks to ferment. Actually, the only ones who continue to use that method today are natural wine producers. To mass produce products that are consistent year by year, you have to use pesticides, add selected yeast, and use other techniques to control the products. Natural wine makers try not to use those methods. They try to make good, strong grapes that are not susceptible to bacteria by using the intrinsic power of the grapes. ─The “Calling All Natural Wine Lovers!” event where you invite all the suppliers is also interesting. We hold this event once a year. We have the suppliers talk about their wines while customers enjoy tasting them. Brand products like Cabernet Sauvignon are the wines that tend to be favored at markets. But farmers making natural wines feel that they want to use grapes that are well-matched to the land and grow them naturally, intervening as little as possible. So, many of them do not want to try to get good ratings. That said, if they don’t have ratings, it is difficult for buyers to determine the quality. That is why the suppliers and sellers play a critical role. ─I understand that you sometimes directly visit the producers. What do you ask them? I am very interested in what their vineyards are like, what methods they use, and what approach they have. Wine is a type of alcoholic beverage that uses absolutely no water, so everything rests on the quality of the grapes. Natural wine producers generally do not use any pesticides and grow their grapes organically, but that should be extremely difficult to achieve. They spend a lot of time thinking about what they can do to keep the grapes from getting diseases. When I visited producers in France, I saw that they had an encyclopedia of weeds. Apparently they can tell the quality of the earth from the growth of weeds in the vineyard. They then use that information to consider various things, for example whether or not to move the timing of the harvest. Once they get started on the importance of the microorganisms in the earth, they cannot stop, and they use techniques like sprinkling crystals through the vineyard for their power to attract sunlight. It is very interesting to see that they think about all the ways to grow healthy grapes. ─Please tell me what you want to focus on to achieve Ginza appeal and for the future of the district. For the district to develop, each of its shops must have appeal and the district as a whole must have appeal — both these things are important. To achieve this, the people of Ginza are involved in various activities. We not only clean the area in front of the shop, we also clean the street. We don’t put signs out on the sidewalk. Through all these efforts, we raise the district’s appeal. When the district is more appealing, customers come. Even if the shops are good, if people don’t like the district, they will be discouraged from coming. The people of Ginza get along well and don’t try to oust each other. When a newcomer arrives, we let them into the circle. We may give them tips sometimes, but we try to work together with them to create district appeal. In actual fact, there are strong connections among us and a strong sense of being a downtown district, and we have a sense of pride for the way we try to improve the area together. There are few places like Ginza that do not have a guardrail. It is thanks to the desire of the people of Ginza to protect our district ourselves that we can create a vehicle-free promenade too. I think this is a unique appeal of Ginza as a district and I will continue to cherish it. Born in Tokyo in 1964. Joined Suntory after graduating from Meiji University. Joined the Fujiki Liquor Store company in 1992 and became the president in 2004. Opened Ginza Cave Fujiki in 2010.